“In its simplest form, the trick works by placing the hat on a specially made table or chest. Both the hat and the surface it is placed on will have a hidden opening in them, through which an object stored in a compartment in the table or chest can be pulled. Alternatively, the performer can produce an item hidden in their sleeve using sleight of hand and misdirection. This eliminates the need to place the hat on a surface, and also allows the performer to give the hat to an audience member for inspection. For our purposes, Donald Trump is the magician, the Rabbit is America’s distrust of politicians and the Hat is their need to see the Rabbit. Yes, the trick is traditionally performed for children, but we are all children in our collective need to see the Rabbit. Please show us the Rabbit, Donald. We need plain talk, comforting and the assurance that someone sees the world in the same simplistic terms that we know are there. Please show us the Rabbit. No one else has ever shown them the Rabbit. The beauty of this is that the liberals among us will forgive him for building a wall dividing Mexico and America if he tells us that economically “we’re Greece on steroids.” We conservatives will forgive him saying the minimum wage is shameful and should be tripled if he assures us that climate-change is a hoax. We’ve seen the Rabbit and the magician tells us outrageous things in the same breath. 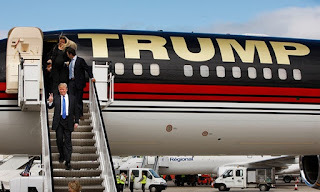 But no one has ever shown us the Rabbit before and here he is, snowy white, long-eared and kicking his feet as he swings right and left, scampering offstage to his own huge private jet—marked TRUMP across its entire length. We’re children again in an adult world we simply no longer understand. If you think this is all overly weird and will soon go away, be careful, be very careful. The last two presidents disappointed substantial portions of America for sixteen consecutive years. That’s very nearly an entire generation of disappointment and disbelief, one a Republican and the next a Democrat. Neither of them had a Rabbit, much less showed it to us. In my long life of observing presidents, I’d count only FDR, John Kennedy and Bill Clinton as having Rabbits and at least letting us have a peek at them (never with full disclosure). America is as disjointed, confused, polarized and run by moneyed interests as I have ever seen it. We’re tired and distraught, as ready as we’ve ever been for an afternoon watching a magician draw a Rabbit out of a Hat. It’s conceivable that we yearn far too desperately for the Rabbit. Will that yearning carry over to the national election? I haven’t the faintest idea, but I am watching politics become more unpredictable than I have ever seen it. It’s very hard to foretell what will happen when a grinning magician with an amazing hair-style walks on stage, a top hat in his hand and a gleam in his eye.